The 2018 off-season will end for the Buffalo Bills in less than a month after the completion of OTA’s and mini-camp. The players will then have a little more than a month off before training camp opens in late July. That being said, what can the Bills expect from OTA’s and mini-camp? With the NFL setting strict rules as to how OTA’s can be run, there isn’t much “real” football to watch. What will be important is how the current players learn the scheme’s of new Offensive Coordinator Brian Daboll. After that will be how quickly can first round draft pick Josh Allen adjust to the NFL? With Daboll having spent many years with the New England Patriots, we can expect that the design of the scheme will be similar to the Patriots as far as terminology and design. What can change is Daboll can tailor the scheme to fit the strengths of the current offensive skill players, especially players such as Kelvin Benjamin and Zay Jones. In the past few years, the Patriots receivers were not in any way similar to Jones and Benjamin. Because there is no contact during off-season practice sessions, it can be difficult to see exactly where the offensive line is. Obviously the coaching staff will know where the group is mentally as far as understanding the new terminology and assignments. But it will be training camp before we know much about the new line group physically. It may be weeks into camp before we know if the Bills need to add a player or two to the group. On defense, because this is the second year in Sean McDemott’s scheme, the players will be in more of a fine tuning mode than a learning mode. Still there are a number of new key players that have been added to the defense so the new veteran players to feel comfortable within the scheme will be important. The new veteran faces are defensive tackle Star Lotulelei, defensive end Trent Murphy and corners Vontae Davis and Phillip Gaines. Of course Lotulelei has played in this scheme his entire career so for him, adjustment is minimal. He will be mainly focusing my on being in sync with his new teammates. What will be more important in the defense will be the integration of the key rookies. As I have stated several times in the past, one of the key players in this scheme is the Mike (middle) linebacker. With the Bills having used a first round pick on linebacker Tremaine Edmunds it is imperative that he gets up to speed as soon as possible. 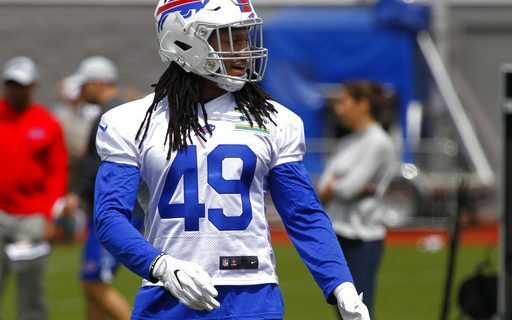 Very few linebackers have the natural physical traits that Edmunds has. What will be key for him is learning the terminology and assignments. Edmunds has to be able to play as fast as his natural traits say he should. That will take some time. The other key rookie on defense is Harrison Phillips. While he may not be asked to be a starter as a rookie, the coaches want him to be a key contributor as a rotational player. For that to happen he will most likely have to learn both defensive tackle positions. The other key rookie on defense could be fourth round corner Taron Johnson. He has a chance to become the third or fourth corner, OTA’s will go a long way in telling the coaches if that can happen this year. The other important aspect of OTA’s and the offseason program in general is finding out how far injured players have come back with the rehab? Will they be ready for camp or will they need to go on PUP when camp opens. If they can participate when camp begins, are they able to go all out or do they have to be monitored for a few weeks. While OTA’s doesn’t give us the answers to much, it can help set the tone for training camp. The more comfortable the players are with what is going to be asked of them in 2018, the better training camp will be. Greg breaks down the Bills personnel on offense and defense.